“A Fine Balance” by Rohinton Mistry is one of the finest (probably only surpassed by Rushdie’s Midnight’s Children) Indian literary novels ever. There have been very few books that have touched my heart as it did. I was new to Bangalore, in 2005 and was looking forward, with a book in hand, to getting lost in the myriad of lanes that the city had to offer. The suburban local was at the outskirts of Bombay; they would arrive at their destination in forty-five minutes. The ’17 Standees Allowed’ by the scratched and peeling sign had already been exceeded by the crush of Sunday morning commuters, but not to the extent of a weekday train: as yet, there were no roof-riders or window-clingers. In the sky the sun was higher than the when the train left Bombay Central. The heat began to strengthen rapidly now, seeming to feed on itself, growing more oppressive with every breath. From metal straps hung the standees, listless, upraised arms revealing identical damp patches under sleeves of shirts and blouses. Overhead, the fans turned ineffectively, whirring and rattling, their blades labouring with feeble rotations, trying to chop the air thick with heat and odour, scattering it around unelessly in the compartment. The book is a collection of eleven short stories set in the 1980s about people living in a parsi colony in Bombay. The stories are intertwined while each story has a main subject/family and at least a few characters from other stories make appearances in each story. As any good book would, this takes a little time to pick up even though the stories by themselves are distinct. But then again, with Mistry, it is not so much about the story but the beautiful prose that he weaves with his simple tools that comprise mostly of words. At times, the stories have an element of shock, but are mostly amusing and sometimes even funny but the common thread that binds them all is the pettiness that was the common ingredient that every middle class family in Bombay must have had in the 1980s — something I could relate to, for I grew up near Bombay at the same time and have seen the city at close quarters. 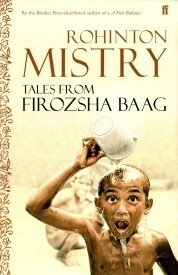 Consider for example, the story called Squatter in which Nariman Hansotia, a man popular with kids of Firozsha Baag for telling stories tells the story of an imaginary cricketer named Savukshaw, the greatest cricketer who played during the times of greats like Umrigar, Contractor and Farokh Engineer. Savukshaw, who gave up cricket for cycling, before he became a pole-vaulter and then a hunter could never find happiness in his life. Eventually Mistry, with Nariman at his aide, tells us about Sarosh, living in Toronto for ten years and yet not being able to balance himself on the western commode. So Sarosh, throws himself a challenge and what follows is a funny account of an Indian immigrant’s life in the first world. Or one could keep thinking about Lend Me Your Light, where the lives of three friends, one of them, the narrator, the other being his brother and the third, a friend, keep crossing each other’s at intervals. Nothing much would have come of it if only the three would not have spent their childhood together. The story depicts how, in the 1980s, the Indian Youth reacted to the hopelessness surrounding the times. But then again, it is not so much about the story but in this case, it is the difficult questions that Mistry asks his readers by way of the characters he beautifully crafts, at will. It is this rush of emotions that these subjects feel and you, the reader, would find yourself inevitably attracted to these viewpoints, almost agreeing to one of them, and maybe taking out time, thinking and answering these uncomfortable questions, looking out ways to possibly ensure that your well-thought of answers that you mumble quietly within the vicinity of your head are somewhere heard. It is what any well told story should do to you, and this one most certainly qualifies for one, as it continues to dwell, this story of three boys growing up to men, living in different lands — Toronto, New York and a small village in Maharashtra but returning home to Bombay with a different set of emotions each time. all writers worked in the same way, they used their memories and experiences and made stories out of them, changing some things, adding some, imagining some, all writers were very good at remembering details of their lives. Father explained it takes a writer about ten years time after an experience before he is able to use it in his writing, it takes that long to be absorbed internally and understood, thought out and thought about, over and over gain, he haunts it and it haunts him if it is valuable enough, till the writer is comfortable with it to be able to use it as he wants; but this is only one theory I read somewhere, it may or may not be true. Ah no, I am not much of a writer but I can see why I keep remembering the past so often. Maybe I miss it so much and that I try to relive the experience by writing about it and talking about it in fine detail, as much as I can, as much as I can afford and as long as I have an audience. Maybe I should start using my memories of growing up on an island near Bombay to good effect. Anyway. So the stories go on but with Squatter, Lend Me Your Light and Swimming Lessons, Mistry saves the best for the last. I wish I could mention more stories but that would be telling too much. Like the taste of filter coffee, the stories linger on long after you are done reading it.